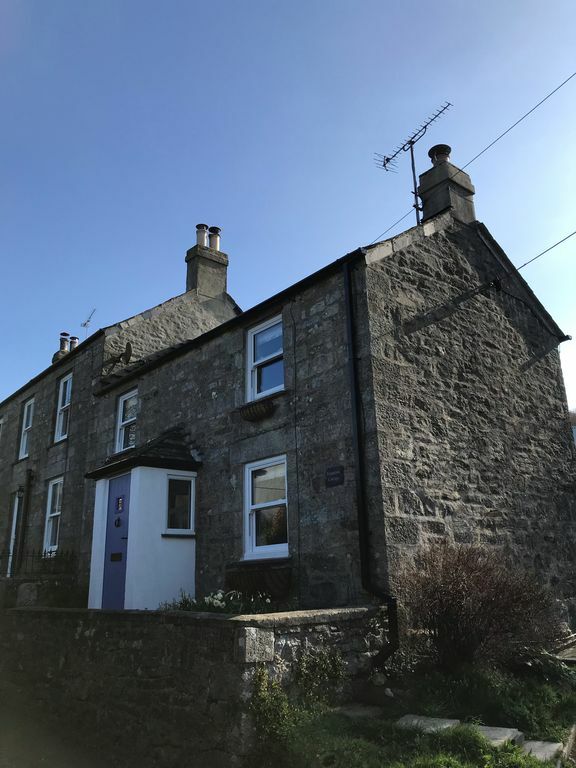 Fountain Cottage is a welcoming, traditional cottage with many original features in the friendly village community of St Breward. Ideal for couples and families wanting a quiet village location, with a wide range of activities nearby. We came here as guests ourselves in 2017 and loved it so much that when it became available, we jumped at the chance to own it! Fountain Cottage sleeps up to four in a double and a twin bedroom. Downstairs there is a compact but well-equipped kitchen and an inviting living area, with an original bread oven at one end and a woodburning stove at the other – the perfect spot to unwind after a busy day on the beach or on the moors. We have a small enclosed seating area to the rear of the property and an off-road parking space. St Breward is a true Cornish village community. There is an Inn with links dating back to the 11th Century and a Norman church at one end, (which both boast being Cornwall’s highest!) and an organic cafe and bike hire at the other, which is on the Camel Cycling Trail. We are on the edge of Bodmin Moor; only a 20-30 minute drive from a wealth of dramatic and beautiful Cornish coastline and with the beaches of south Cornwall also within easy reach; and a number of cultural, historic and television/film sites close at hand - Jamaica Inn, Poldark and Doc Martin to name a few! We are a family of four and a Working Cocker Spaniel, with a passion for this part of Cornwall and all it has to offer. We bought the cottage in late Summer 2018, with the intention of using it ourselves, but also sharing it with others who want to visit the local area. We hope to give visitors the perfect base to get to know and love this part of the world as much as we do! Lobby - we have a lobby area as you enter at the back of the house. Perfect for leaving muddy boots, dog leads and coats. There is a clothes airer and hoover in case of need! Kitchen - Oven, hob, fridge, microwave, dishwasher, washer/dryer. We like to cater for ourselves when we are on holiday - so we have ensured that there is plenty of crockery, cooking utensils and cupboard space. Living area - we have a warm and inviting living area, comprising of both a dining table and two sofas. At one end is a traditional (but non-working!) bread oven, and at the other is a wood-burning stove, ideal for sitting in front of with an evening glass of wine or mug of cocoa. We have Sky Q, broadband WiFi and an extensive range of books, DVDs and games for use of our guests. Bathroom - large shower room - which very much boasts a loo with a view across the moor! Outside - we have a small, but secluded garden with a seating area and table - complete with views across the moor. You will find tea, coffee, milk and sugar so that you can have a cuppa after your journey, bread, spread and jam, a bottle of wine and the cleaning/washing up essentials in the kitchen, a couple of toilet rolls and handwash in both the bathroom and kitchen. The cottage will have been prepared by our excellent housekeeper and we hope that you will be delighted with it – however, if you find that you have any problems, our handyman is a few doors down the road and will be happy to put things right. Large bathroom with large shower cubicle with grab rail. Wonderful "loo with a view" across the Moors! Space to rear of property suitable for one car. On-road parking is possible, but guests are requested to be mindful of our neighbours' parking needs. Woodburner in living room with wood supplied. Also non-working fireplace with bread oven feature. Through-lounge and dining room with feature fireplaces at each end. Two sofas. Dining table to seat four. Books, games, DVDs for guests' use. Sky TV Entertainment package available. Small raised garden to rear, with seating/dining area. Outside tap with hose for cleaning boots/muddy dogs.